I have been wanting to make valentines and give you all some fun ideas for your cards but I have been swamped. So when I got my mail and found this beautiful handmade card, I could not wait to share. 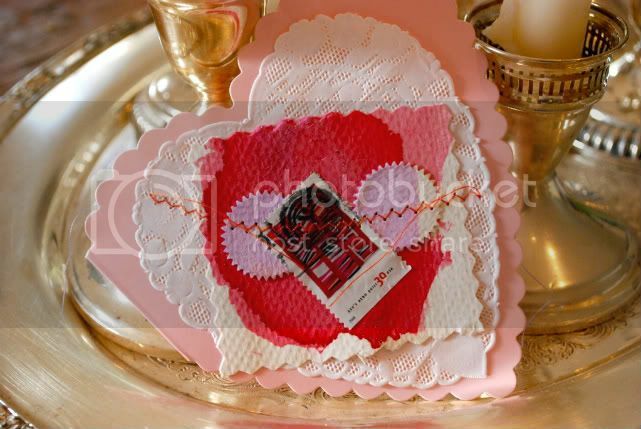 My sweet friend Elizabeth sent me this card with a doily, stamp, painted paper all sewn together to make a lovely valentine. very sweet. I haven't even thought of Valentines yet. You should do a "10 great things to do for your mate on Valentines Day" post. I could use some help. ***also, I spotted 2 more typewriters at the thrift store. Not sure if they work or not"